Forget your Doom, your Quakes, and your Half-Lifes. Wolfenstein 3D, you see, is the tobacco-chewing, shotgun-cradling, vaguely inappropriate but highly charismatic grandaddy of first-person shooters. Hell, it pretty much stepped in to help raise shooters in general, after their parents were killed by that nasty barbecue accident (that's what happens when you cook on a red barrel). Unsure as to how a 22 year-old purveyor of pixelated Nazis could still hold so much influence more than two decades later? Well then it's fortunate that, in true high school maths fashion, I've made sure to show my working for the above statements over the following page. Scroll on, and you shall be able to read it. Kind of a big deal, this one. You see, the FPS is fairly well-liked these days. Never in human history, except perhaps during World War 2 itself, has the process of shooting men in the face from a first-person perspective been more popular. Wolfenstein is responsible for that. Okay, technically it refined pre-existing ideas into a newer, better format, but then, rocks and caves existed before we invented houses. And that's precisely the kind of scale-up we're talking here. Although very basic first-person games such as Spasim and Maze War had existed in the late '80s, followed by first-person RPGs like Ultima Underworld in the early '90s, Wolfenstein accelerated the concept like never before. Faster, cooler, and more involved, Wolfenstein 3D was a stunning showcase for the advanced tech skills of dark coding mage John Carmack. But it was also much more. With its brisk, brainy conceits, it kickstarted the entire FPS race by setting the standard genre design model for about a decade. Sally forth, and I shall explain further. There are certain design tropes that we take for granted in FPS. Certain innate systems and set-ups that we instinctively know to be 'just the way things work'. In fact many have now filtered their way through into the wider realm of action gaming in general. And a whole bunch of their early foundations were popularised by Wolfenstein 3D. In the same way that we all now instinctively understand the general tropes of how action games work, every gamer in the world understands the archetypal weapon tree of the first-person shooter. It's been unspoken, shared knowledge for so long that many now confuse it for a primal, inherent genetic memory, like the fact that bread is tasty or that wasps are bastards. But it's not. It's another thing that Wolfenstein came up with. The short-range, desperation melee weapon. The better-than-nothing pistol. The trusty-but-unspectacular machine gun. The short-lived, cathartic fury of the chain gun. With the later SNES port adding the anarchic, multi-directional destruction of the flamethrower, and the Holy Grail of save-it-'til-you-need-it weapons in the form of the rocket launcher, that's every archetype of FPS weaponry locked down. Every action-game kill-tool, barring only the shotgun introduced by Doom, is a variant of those. In generic function, if not in exact form, Wolfenstein decided on the video game guns we'd be using for decades. The shareware distribution model was the Kickstarter or Steam Early Access of the early '90s. We might think that we're all very clever with our modern, internet-distributed, community-supported, pre-release indie game love-ins, but shareware was the precursor of that whole philosophy. And although it had been around for a few years before Wolfenstein 3D was launched, Id's Nazi-pulping simulator sent it through the roof. Using the shareware system - whereby players could access around a third to a half of a new game for free, before paying for the rest - Id's sales for Wolfenstein rocketed past those of its previously best-known franchise, Commander Keen. And when Doom springboarded off its predecessor's success using the same system... Commercial and cultural nuke. And it wasn't just the Id canon that benefited. For a period in the mid-'90s, a swathe of independent developers launched iconic franchises (FPS and otherwise) using the model. Heard of a company called Epic? Yeah. And now things are coming full-circle, with early access sales and crowd-funded indie games dominating the landscape again. Which is great. But never forget that the cycle started with Mecha-Hitler. 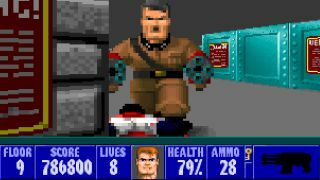 While we're on the subject of player-supported gaming and development, it's worth noting that Wolfenstein 3D (accidentally) paved the way for more than a few careers by way of the modding scene. You see, while Wolfenstein 3D itself wasn't designed to have mod tools, fan passion led to a whole bunch of unofficial character and level editors. Id quickly caught on to that, and built Doom specifically for easy modding. That cemented a vast legacy for the demon extermination sim; indeed, one that still thrives today, and even led to Doom 2016's pioneering, built-in SnapMap tools. But it also instigated a culture of modding that launched a pantheon of developers (perhaps the best known is Randy Pitchford, from Gearbox) from their bedrooms to the big time. Rambo and Matrix were the two Johns of bicep-bulging bullet-fun years before Wolfenstein's BJ Blazkowicz picked up the baton. But we shouldn't overlook how fundamental Id's hero was in making the archetype a video game staple. Prior to Wolfenstein, action-game heroes were an odd, eclectic bunch, comprising little kids, wizards, out of work D&D extras, plumbers, animals and whatever abstract shapes could fit into a limited number of pixels. Blazkowicz, though, brought cinema's archetype of the badass, one-man bullet volcano to gaming, and with it, perhaps the first (silly) step towards more adult characterisation. Yes, it's entirely understandable that you might curse his name to Hades for the proliferation of grunting, bald-headed knuckle-men that he and Doomguy later wreaked upon the world. But by bringing a relatively adult cinematic character-type to high profile acceptance in gaming, Blazko almost certainly helped the pastime take one of its earliest small steps away from being perceived as a child's plaything, and towards becoming a medium in its own right. It might be surprising, given that the last generation or so saw World War 2 shooters become as prolific as dashed naive hopes around a Sonic game, but the setting really hadn't been explored by games very much at all before Wolfenstein 3D. There were a few flight and vehicle command simulators like The Red Baron, Silent Service, and Conqueror, but little in the way of pure action games. Perhaps due to an understandable desire for reverence, gaming's treatment of WW2 was sparse and largely limited to more cerebral, slightly distanced experiences. The visceral, harrowing, on-the-ground action just wasn't represented. Obviously, Wolfenstein 3D blew the doors off that thinking in 1992. Now of course Wolfie is no poignant, historical document. It doesn't pretend to be for a second. But by giving World War 2 such a balls-out, explosive, cartoony treatment - and getting away with it - it definitely opened up a whole new avenue for the conflict's exploration in gaming. Once Blazkowicz had chaingunned half of the SS into chunky pâté, the gates were open. Okay, so Wolfenstein hardly invented the occult Nazi stereotype. It's been around for decades. Just watch Michael Mann's The Keep if you dont believe me. In fact watch The Keep anyway. It'll improve your life. But let's face it, video games have run with the Nazi zombie idea like no other medium. If there were royalty payments for ideas, Call of Duty would be knee-deep in dept by now, and John Carmack would be tinkering around with diamond Oculus Rift screens on his private island in space (which floats upon the back of a giant robot T-Rex of his own making). Actually, scale that last sentence up a bit. We're talking about Carmack here. That's just his Tuesday mornings.